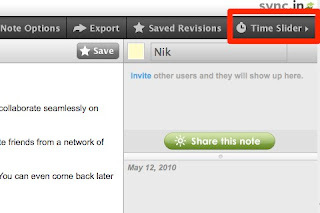 If you have ever seen PrimaryPad or EtherPad, then Sync.in will probably look quite familiar. 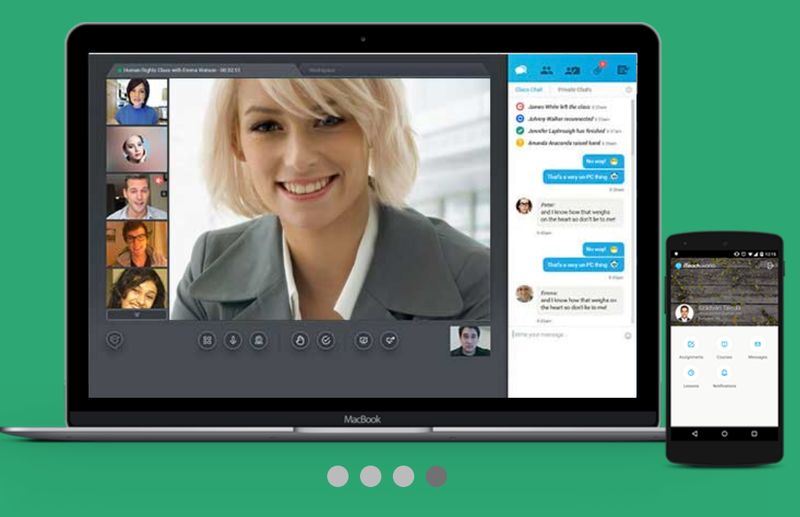 It's an online collaborative text editing tool, that allows multiple users to work on the same text synchronously. 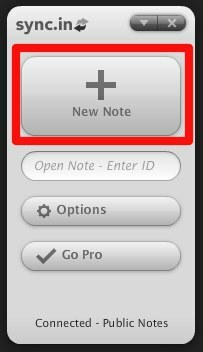 It's very simple to use, you just click on the 'Create a New Public Note' button and it launches the text editor and gives your text a unique URL. 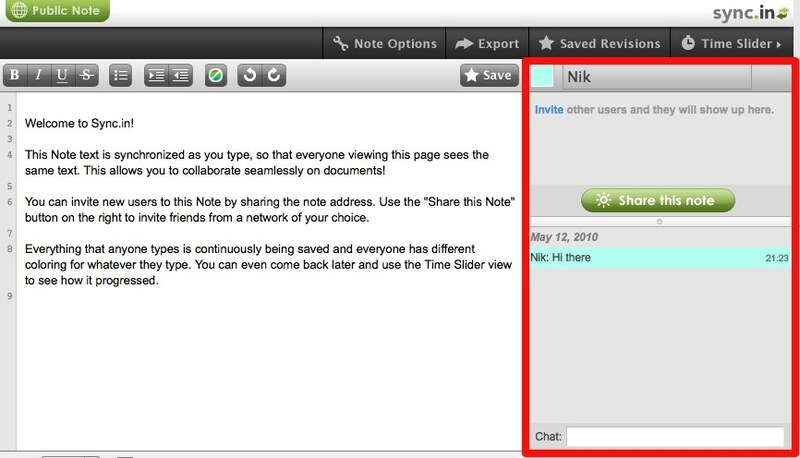 You then just click on 'Share this Note' to send your URL to any of a number of different social networks or by email. Once visitors click the link they can start editing the text. 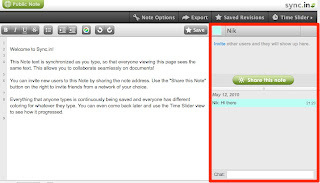 The edits of each visitor are colour coded and they can even communicate with each other while they edit by using the text chat window that opens by the side of the document. It isn't clear exactly how many visitors can work on the same text (PrimaryPad supports groups of six) but having too many people working on the same text can often lead to chaos. Sync.in has very hand desktop launcher though, so you can create multiple pads and then get different groups of people using them, just by clicking on the 'New Note' button. One of the other interesting features is that you can use the 'Time Slider' feature to 'replay' the development of the text. This shows you how and who has developed the text, added and edited parts. This is a great way to track how much work each of your students did on the text. I've added a pad below so you can click the link and try adding ideas on how to use Sync.in and editing other people's ideas. I'm not sure how long this will stay live though. I hope you find this useful and manage to add some ideas or leave some comments. 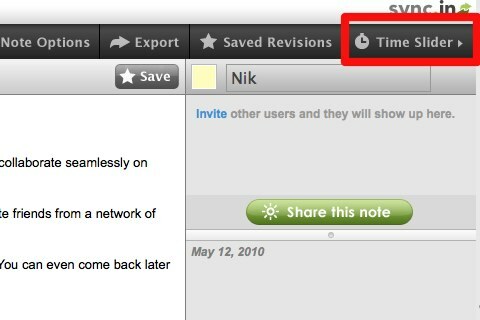 Hey Nik, one additional trick for sync.in is that users can create their own customized URL. Just remove the text immediately after the sync.in/ and replace it with your chosen page name. If it's not taken already, it's yours.